Not quite heaven 17. 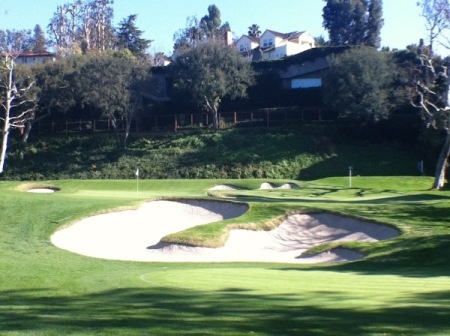 Harrington will be disappointed with the bogey six that cost him a vital shot at Riviera's 590-yard par five.Padraig Harrington made a frustrating start to the 2010 season when he missed the cut by a stroke in the weather ravaged Northern Trust Open at Riviera Country Club. Two months off is bound to lead to some rustiness and just as he had predicted before he made the long trip west, it was Harrington's lack of sharpness in the short game department that cost him. "I am going to make a few mistakes during the week, not that I don’t make mistakes every week, that are going to be through not being ship-shape, not being competitive," Harrington said towards the end of his winter break. "I am going to hit a slack chip shot here or there. I am going to lose my focus a couple more times than I would later on in the season. I just have to accept that fact and get on with it. "The key for me for first three weeks is to try and get the mental balance that I had towards the end of last year in the last three or four months of the season. I have to start off that way and let the results happen." Harrington opened with a one over 72 and having slipped to three over for the tournament to three holes of his second round to play, he managed to birdie the par three 16th before play was suspended until Saturday morning. Resuming on two over par with just the 17th and 18th to play, two pars would have been enough to qualify for the last two rounds. But he bogeyed the par five 17th when he bunkered his third shot in an aggressive attempt to make birdie and failed to get up and down. A two over par 73 left him out in the cold on three over par and hoping for better when he heads up the coast to the Monterey Peninsula for the AT&T Pebble Beach National Pro-Am next week. No doubt, he will be working hard on his short game and putting in particular. Harrington paid a high price for his aggressive third to the 17th.Scrambling statistics are a reflection not just of a player's pitching and chipping skills but also of his putting prowess and Harrington saved par just 50 percent of the time in Los Angeles, compared to a a field average of 61 percent. "I am always excited at the start of the year and I have never been happier with my golf swing," Harrington said heading into the event. "I am little bit apprehensive with my short game because of the change in grooves. I am going to make a change to my putting routine that is solving a problem I have had for quite a while with my putting. "It is all about improving and I do believe I have improved. Results ... I got a little bit anxious towards the end of last year trying to force the results. The results come when you do the right things so I have to stay patient with that. "If I go six or seven months of the season and I haven’t had a result, I probably will get anxious about them again. But at the moment I have got a year ahead of me and I have just got try and go out and let it happen." As a result of his missed cut in LA, Harrington is now outside the nine automatic qualifiers for the European Ryder Cup side. Martin Kaymer's fourth-place finish at the Dubai Desert Classic lifted him above Harrington on the world points list from which the first four members of Colin Montgomerie's side will come. Padraig Harrington admits that his season has been a “washout” so far. And after finishing amongst the also-rans at the Open he’s not sure when he will emerge from the doldrums. 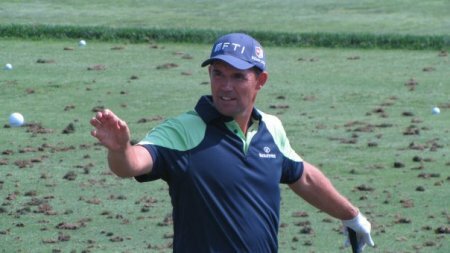 Padraig Harrington is battling to emerge from the depthsReflecting on his slump in form on his website, he said: "I am aware that most of my season to date has been a washout but I am still confident that the short term pain will lead to long term gain. Padraig Harrington admits he has serious “elf” problems as his season goes from bad to worse. The struggling Irish ace reckons he’s being so hard on himself because of his poor shots that he’s as troubled as Dobby, the elf from the Harry Potter books.